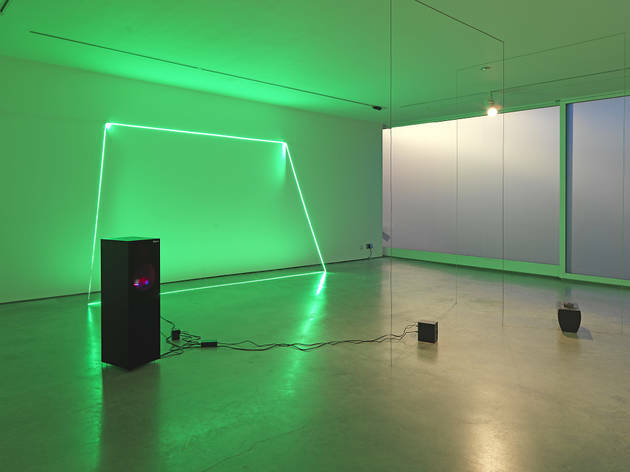 Simultaneously resembling a technophobe’s approximation of where the Internet is kept, some pre-millennium hacker’s den and Dr Strangelove’s war room, Haroon Mirza’s landscape of new kinetic installations only trifles with instants of recognition. In the past his sonic works have intersected with distinct moments in social and cultural history, but this new body of work represents a shift away from examining any specific aural traditions. Instead, Mirza progresses further into the uneasy territory of the taxonomic glitches that disturb our classification of noise, sound and music. A cacophonous drone of sirens, strobes and strewn constellations of clunky audio-visual kit, Mirza’s ‘Evolution of a revolution’, the first of three verbosely titled installations, appears at first chaotic. Given time, however, hollow pops from over-sized speakers begin to sync with the static purr from a spinning 12” – a compositional order slowly comes into play. 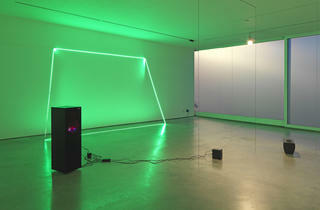 Similarly, the minimal geometric forms of Mirza’s sculptural constructions – upturned tables, a mirrored box, monitors – become apparent. ‘Cross Section of a Revolution’ features found footage of an anguished political speaker and three sequenced film fragments of African drummers. Although referencing social rituals, any meaningful connection with their greater contexts is superseded by an appreciation of the bangs and pontifications. Having impressively slowed down our consumption of these works, Mirza’s installation forces us to re-assess their sonic qualities. Comparably, the angled screens soon emerge as the estranged surfaces of some floating rhomboid. A departure for Mirza, the real interest here lies in his artful construction of an abstracted environment that slips beyond categorisation while offering intriguing moments of self-governing cohesion.